My beloved Saints won their playoff game yesterday. As die hard Saints fans, my whole household is ecstatic. Just as important, I had my husband to give Mr. Scale leave today so I could weigh in and THERE WAS SCALE MOVEMENT! I am so glad to see Mr. Scale finally showing me some respect for all my hard work. 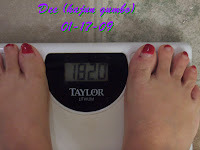 I am down to 182, a 3 1/2 lb loss in one week! I am loving the magic from my last fill. This weight loss is giving me incentive to keep on keeping on! Mr. Scale is now safely hidden again until next Sunday's weigh in. Amazing!! Your plan is clearly working-- go woman!! Fantastic on the weight loss! I watched the Saints game yesterday - wow, they were in control of the game the whole way. Way to go!! You WILL make your Valentines Day goal, I am sure of it. Also, congratulations on the Saints winning!!! Fantastic numbers lady !! Me too waiting to see those post fill numbers next week ! So done with the 1 lb drop for the past 2 weeks !!! i will be in new orleans in april for business... maybe we can meet for a shake!